A polymer is a unique molecule that is made up of many identical units. Each individual unit is called a monomer (“mono” means one and “mer” means unit). The prefix “poly” means "many" -- a polymer is many units. Often, however, different polymers are blended together to impart unique or desirable chemical or physical properties. Each type of polymer has a certain density (mass per unit volume). The density of a polymer blend is the sum of the mass fractional density of each type of polymer. Determine the density of each polymer type using the specific gravity and comparing that to water (specific gravity = 1.0). The "Polymer Technology Dictionary" contains the specific gravities of most common polymers. Polypropylene has a specific gravity of 0.89 and polyethylene has a specific gravity of 0.92. 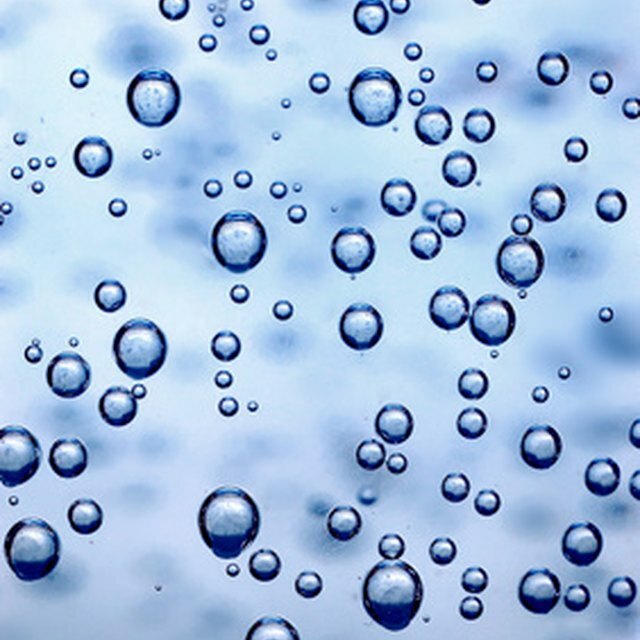 Since the density of water is 62.37 pounds per cubic foot, the specific gravity of other materials is multiplied by this density to determine a density relative to water. For polypropylene, this works out to be 0.89 x 62.37, or 55.51 pounds per cubic foot. For polyethylene, it works out to be 0.92 x 62.37, or 57.38 pounds per cubic foot. Determine the density for the polymer blend by adding the mass fraction densities together. This is done with the formula 0.70 x 55.51 (polypropylene) + 0.30 x 57.38 (polyethylene) for an answer of 56.07 pounds per cubic foot for the blend. Polymer Technology Dictionary: Compound Blending, Page 83. Tony Whelan. Springer. 1994. Baer, Brian. "How to Calculate the Density of a Polymer Blend." Sciencing, https://sciencing.com/calculate-density-polymer-blend-8516878.html. 24 April 2017.